Parents of many families who celebrate Christmas know that kids can get easily caught up in the commercialism of the holiday season. Here are my picks for fun gifts that kids will be excited about, but that also can potentially bring the family together for quality time. Best of all, each of these gift suggestions can be enjoyed not only now, but during the other 11 months of the year either among siblings and their friends or with the whole family! 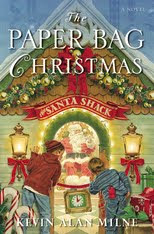 Paper Bag Christmas, $14.99, by Kevin Alan Milne, is a hard cover book that will inspire both kids and their parents. Even though the setting is the Christmas season and its two main characters have outgrown their belief in Santa Claus and go to the mall to see the jolly old fellow at their parents' insistence anyway at the beginning of the book -- the real message of this story isn't limited to Christmas or even to the holiday season that runs from Thanksgiving through the first of January. On a more meaningful plane, it's about how each person can not only touch others, but also enhance our own lives year-round, if we expand our sense of holiday goodwill to the rest of the year. In the book, the two boys Molar and Aaron are no different than their materialistic friends as they face the upcoming glitz and glimmer of the Thanksgiving to Christmas marathon that is all too familiar today. That is, until the story takes a dramatic turn and these kids meet a pediatric oncologist, who insists they join him at the hospital dressed as elves to bring cheer and caring to his young patients, some of whom are suffering from terminal cancer. Published by Hachette Book Group. Available nationwide at bookstores and online. 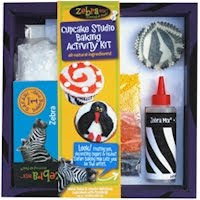 Zebra Mix Cupcake Studio Baking Activity Kit, $22.99, comes gift boxed with everything needed for the whole family to have a great time together baking very creative cupcakes. This all organic set features cupcake mix, frosting mix, 3 packs of sanding sugars, a reusable zebra frosting pen, 12 zebra print cupcake papers and a safari baking map with step by step directions. The box says this is for ages 4-12, but I think this is a fun activity that older kids and young adults might enjoy doing together, too. With this kit, the participants are limited only by their imaginations. 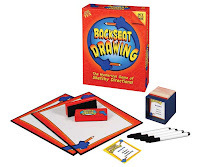 Available from Zebra Mix and at specialty stores such as ToysRUs, Nordstroms, Sur la Table, Borders Books; more on the product line and where to buy here . Fairy Houses and Beyond, $15.95, by Barry & Tracy Kane, is the second book by this couple that photo documents the fairy house craze that has begun to spread across the nation. The tradition of fairy houses is thought to have begun in Maine and families have been building these sweet little homes of natural materials for decades ever since. The cover of this book is just the tip of the miniature, whimsical and exquisite shelters you will see inside, built by young and old in a variety of places -- from Tucson, Arizona to the White Mountains of New Hampshire. Watch for an in depth book review on this title shortly by Mini MommyBlogExpert who guest writes for this blog and recently became hooked on this hobby after reading the Kanes' books. Available from the publisher as well as online and in select book stores nationwide. Classic and Updated Hasbro Games, About $8.99 - $29.99, are fun at almost any age, and all succeed in bringing family and friends together. Prior to this holiday season I had no idea that Hasbro produced all the games mentioned in this post. 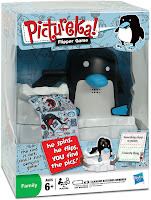 Among the most high energy of the current Hasbro game line are Pictureka! Flipper, $24.99, which was also featured in the Best of 2009 Gift Ideas for Thanksgiving, and Bop It , $19.99, that will be reviewed on this blog in more depth after one of our 12-year old triplets has given it an extensive test drive comparing it to another generation of this toy which she used to play with. 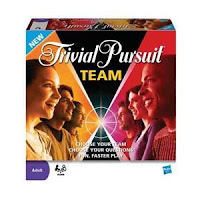 Then there is the fun, mentally stimulating and educational game of Trivial Pursuit Team Edition, $29.99, which is good for getting teens and young adults talking again with their parents. Finally, there are two classics that have been updated for today's faster pace of living and traveling more: Monopoly Go, $19.99, and Scrabble Apple, $8.99, both new takes on classic games baby boomers will remember from their own childhoods that they can now play in the car and on a plane with their children and grandchildren because they are both compact and portable. Stay tuned for in depth product review posts on each of all these games as MommyBlogExpert's family begins the new year by spending quality time with family. Out of the Box Publishing, $19.99-$24.99, offers some of the best family-friendly board and card games according to my kids and this Mom tends to agree. 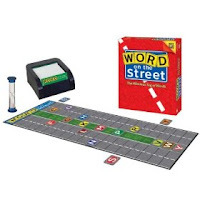 For the holidays, we recently received three of their new games for test and review Word on the Street,$24.99; Backseat Drawing, $24.99; and Ninja Versus Ninja, $24.99. 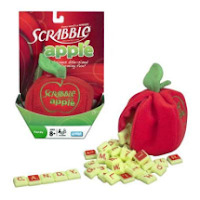 Prior to the receiving these games, I was already familiar with this company as we own several versions of their highly successful Apples to Apples games, though I did know know they also made such as variety of other games. Of the three new we are reviewing, my triplet 12-1/2 year old son is wild about the Ninja game the most -- probably because this is such an excellent strategy game that he can play with both his friends and family. Look for in depth product reviews later on each of these game titles, once our family has spent some real quality time playing these. 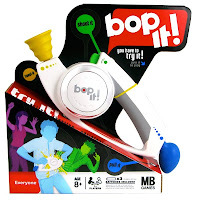 All available from Out of The Box at www.otb-games.com and at many specialty toy retailers. 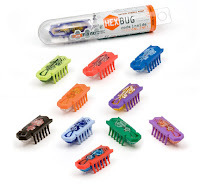 HexBug Nano, $9.99 each, from Innovation First International, is a tiny gift that will go over big this for Christmas, for boys and girls. No doubt it will get mom or dad down on the floor, too, chasing these cute electronic bugs around the house. Each micro robotic creature is battery powered and comes packaged separately with its own unique code inside the box to register and play online too. Hexbug Nano is available nationally at ToysRUs and Radio Shack. I Am An Author: Online Edition, $29, Kids Write Books, a subsidiary of Cherish Bound, a direct self-publishing company, is an opportunity for a child to get his/her own book published. Ideal for use with homeschool, scout groups, after school programs, and other non-school programs which promote literary and storytelling to kids. MommyBlogExpert is planning a test and product review of this item next year so watch for an in depth review once we've tried it. Available online direct from Kids Write Books. Watch for MommyBlogExpert to soon add this item to the other prizes I'm giving away during the Holiday Contest here through January 4, 2010. Knock, Knock...Where Am I, $9.95, by Brady & Sam Ettenson, is a brain puzzle book by two kids (age 11 and 13). Yes, that's right, kids wrote this great paperback that makes it fun to learn about U.S. and world geography as a family. Questions about geography are asked as riddles in one part of the book, and in another there are fun facts about different states and countries. Good things answered are included in the back, as some of these are real brain teasers. Great to play at home, in the car, and even while traveling by plane, this will challenge the grown ups as much as the kids. 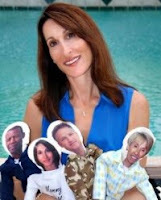 Available online direct from Knock Knock Where Am I Watch for MommyBlogExpert's holiday giveaway of this book shortly. TravelKiddy Bag of Fun, $29.95, is filled with everything your child, ages 3-6, might want or need whether your family is going on a road trip vacation or traveling by plane to visit grandparents. Get one of these ready-packed bags for your child and they'll be busy for hours. Here's just some of the many fun and practical items packed in this heavy duty 11" x 15" x 3" durable lime green canvas bag: 9" x 12" foam core drawing board, crayons, Melissa & Doug Doodle Pad, stickers, mini jungle animals, coloring and activity books, facial tissues, sanitizing wipes, bandages, and much more. The TravelKiddy carrying case is shown, as well as items representative of what you'll find inside (contents may vary slightly from picture). More details of what's included in this Basic TravelKiddy here. Available online direct from Travel Kiddy. Watch for MommyBlogExpert's holiday giveaway of this book shortly. FTC Disclosure: For this holiday gift showcase, Mommy Blog Expert received the products and/or services from companies mentioned for test, review and/or to giveaway to this blog's readers. Exceptions: No products and/or services were provided by Save The Children. MommyBlogExpert was neither paid nor received other compensation from any company mentioned in this post. See complete FTC Disclosure information that appears at the bottom of MommyBlogExpert's main page and at the bottom of every individual post on this blog, including this one. I think the Classic and Updated Hasbro Games would also be a perfect gift for dad this coming father's day. It's a nice thing that I dropped by your blog. Thanks for the idea.